Architectural inscriptions are a fascinating aspect of Islamic cultural heritage because of their rich and diverse historical contents and artistic merits. These inscriptions help us understand the advent of Islam and its gradual diffusion in Bengal, which eventually resulted in a Muslim majority region, making the Bengali Muslims the second largest linguistic group in the Islamic world. 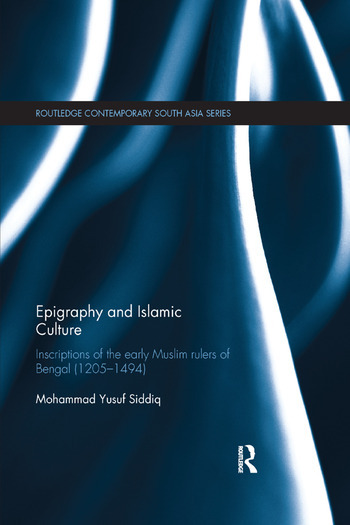 This book is an interpretive study of the Arabic and Persian epigraphic texts of Bengal in the wider context of a rich epigraphic tradition in the Islamic world. While focusing on previously untapped sources, it takes a fresh look into the Islamic inscriptions of Bengal and examines the inner dynamics of the social, intellectual and religious transformations of this eastern region of South Asia. It explores many new inscriptions including Persian epigraphs that appeared immediately after the Muslim conquest of Bengal indicating an early introduction of Persian language in the region through a cultural interaction with Khurasan and Central Asia. In addition to deciphering and editing the epigraphic texts, the information derived from them has been analyzed to construct the political, administrative, social, religious and cultural scenario of the period. The first survey of the Muslim inscriptions in India ever to be attempted on this scale, the book reveals the significance of epigraphy as a source for Islamic history and culture. As such, it will be of interest to students and scholars of Asian Studies, Asian History and Islamic Studies. Mohammad Yusuf Siddiq is President of Bangladesh Association for Needy People’s Improvement. He has written extensively on the history, civilization and culture of Muslim Bengal, including a dozen entries in the Encyclopaedia of Islam.